Many of you may be reading this as part of the requirement for our Online Applications for Technology class, and some of you may be just browsing through my blog. For those of you who aren't in my class I'd like to take a second and tell you a little bit about the project we're working on. I'm currently working to complete my Masters in Educational Technology through Missouri Baptist University. 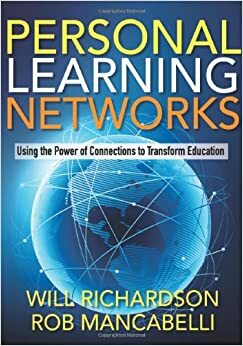 This semester I'm working on another online course and we are required to read Personal Learning Networks, Using the Power of Connections to Transform Education and blog about it each week. If you're interested in getting your hands on your own copy you can find it, here, on Amazon. That quote was taken from Stephen Downes' essay "A World to Change" and was quoted within the first chapter of the book. I found this quote to sum up exactly the shift we are beginning to see in education. With the technology and the resources that we have available I believe that it is so important that our students (and colleagues) start to see that the possibilities are endless. -better prepared for life and work in the 21st century. -more engaged in the classroom. -responsible for their own learning. -able to receive more individualized instruction. Schools are also able to save time and money and the adults become better at their jobs and build problem-solving capacity. As I continued reading I became more and more eager to implement PLNs in my classroom. However, after reading that making the shift to PLNs requires a commitment to move to a networked learning culture I could only wonder, how can you make this work when your whole building doesn't make the shift? After reading chapter 2 and seeing all the ways you can work to build your own PLN I was feeling pretty confident. About a year ago I started my journey across the internet to connect with teachers from all over the world - one of the reason's I started this very blog! In addition to the blog I love Facebook as a networking tool. I belong to the Facebook group Primary Teacher Ideas and Resources. There are over 6,000 teachers who belong to this group. I have learned that it is great to have a sounding board that has no direct relationship with my school or district. Twitter is another great resource (follow me @2ndWithStrunk). Our building utilizes Twitter a lot. Our administrators often share links on Twitter and we use the tool to host book talks with our staff on a weekly basis with a building hashtag. I am looking forward to continuing this book and finding ways to transfer my love of networking into the classroom to benefit my students. First, I want to say your blog is awesome! I love it! I also liked several of the points that you brought up. The seven traits of a student who participate in PLNs also caught my eye. Those seven traits are all things we should be moving towards in our classroom, and things we want for our students. PLNs offer such an easy way to help our students move toward the goals listed in the seven traits, especially getting them ready for work and life in the 21st century. I thought your point about moving toward a networked learning culture was interesting. One of the things I took from this chapter was that while PLNs can be simple to start up, the commitment that it takes can be a bit overwhelming. With the help of our schools, I think it can make it a little less daunting. How to do you get everyone on board with PLNs when people's experience with technology is so varying? I think people's experience with technology is a major factor in using social networking as a professional development tool and a tool for the classroom. Your blog rocks! You def. know what you are doing here. I need to learn how to make my cute and personalized with widgets like you! I wanted to chime into the building topic. I think it is wonderful if a whole school jumps on the bandwagon. As we know, its hard to get 100% committed coworkers to jump on it and drive. I think the great part of PLN is the fact its personal individualized development (as well as FREE). If we think its important to us, we can implement it ourselves! It is a but scare unsure what and why we are doing this we are already better off being introduced to the resources within our Grad program. Good luck! I look forward to checking out your blog some more!! When I train teachers around the country, I always ask how many have a PLN and consider themselves to a networked teacher. In most schools, there are usually only one or two teachers that raise their hand. Change is hard for people in general and change that involves technology seems to be especially hard for teachers. Sharing what you are doing and what you have learned from your PLN can often enticed other teachers to begin creating their own PLN. Leading by example is often better motivator than making something a requirement. Donors Choose - Getting Your Project Funded!